LOCATORS - WHAT ARE THEY AND HOW ARE THEY CALCULATED? This article is an attempt to help those who may wish to calculate their IARU and WAB locators. A quick look through the RSGB course notes did not reveal any mention of either of these location systems and I hope that the information will also be of help to newly licensed hams. There are two main location systems in common use in the UK. One is mainly used for international purposes and is the International Amateur Radio Union (IARU) system and based on the Maidenhead Locator system. The other system is the Worked All Britain (WAB) system. 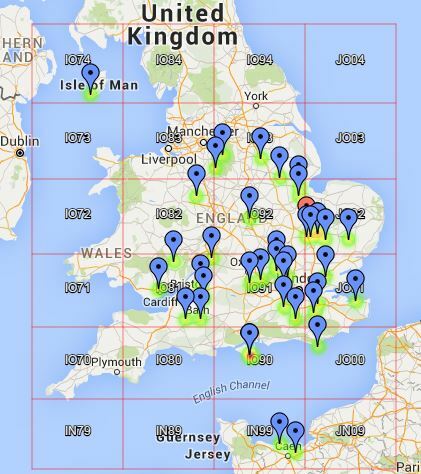 Many GPS systems are able to display the Maidenhead Locator as well as National Grid References (NGR) etc. RSGB Yearbook describes how this system works and how to calculate your location. Known in amateur radio circles as the IARU Locator, the system breaks down as LLNNll (i.e. 2 upper case letters, 2 numbers, and 2 lower case letters). For international purposes, normally only the first 4 characters are used, the remaining 2 being used more locally but not exclusively. Calculating locations from the Yearbook is somewhat tedious and, so long as you know where you are it is possible to obtain the data very easily using free software available on the internet. Choose decimal degrees and enter the lat/long figures in the appropriate boxes omitting any minus signs. Degrees North is already selected but you may have to select degrees West or East depending on which side of the Greenwich Meridian you are. (If the longitude figure was preceded by a minus sign, select West. This applies to most of the UK). 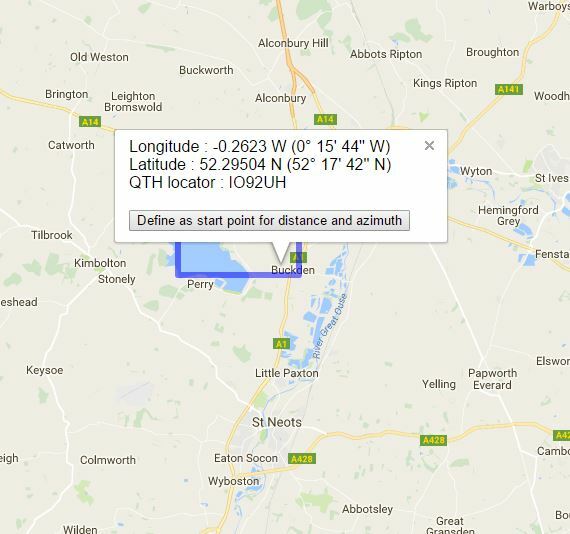 Click on Convert to Grid Square and read off the location (in this case IO92wk). The WAB system is based on the Ordinance Survey Grid Reference System. Going back to the first browser session, the one where you got lat/long from (now you know why we didn't close this session), read off the the Grid Reference (the 1st parameter at the bottom of the page) in this case I got TL 29448 85307. This is the Ten Figure Grid Reference and is far too accurate for our purposes. We need only a Two Figure Grid Reference which is derived from the first figure in each group i.e. TL 28 and this is what you should quote if asked for your WAB location. Sometimes you may find it useful to have to hand other data: I keep a card by my rig displaying the following, complete picture: Postcode, Lat/Long in degrees and minutes, NGR (to six figures i.e. the first 3 from each group), WAB, IARU. To calculate Lat/Long in degrees and minutes, go back to Grid Square Converter, select Deg/Min/Sec, and press Convert to Lat/Long. I got 52 degrees, 26 minutes, 15 second North; 0 degrees, 7 mins, 30 seconds West which I rounded to 52 degrees 26 minutes North; 0 degrees 8 mins West. NOTE: CONVERTING LOCATORS TO LAT/LONG WILL GIVE THE DATUM POINT FOR THE LOCATOR SQUARE. If you used Google Earth earlier you will get more accurate figures. Any errors, omissions, and comments please to M0VTG. DO I BUY THAT METER? Recently, a friend bought a large analogue meter at a rally marked 0 - 600 Amps with the intention of modifying it for demonstration purposes. The size of the wiring and terminals suggests that an external shunt (probably with some cooling arrangement) was originally used. There are no other markings on the meter leaving the problem as to where to start. This article may be of interest to anyone faced with an analogue meter of unknown characteristics. Firstly, very sensitive meters in the µA ranges could be damaged if you try to measure the coil resistance directly with an ohm-meter so don't be tempted. The expected range of of coil resistance values is shown in Table 1. Assuming the worst i.e. that the FSD without a shunt is 50 µA, if the coil is 1800 ohm a quick calculation will show that only 0.09 volts are needed to deflect the meter to full scale rising to just 0.15 volts for a 3000 ohm coil. These voltages are much smaller than those generated by ohm meters hence the difficulty with direct methods. Instead an indirect method is used. To make use of the table we need to discover the current needed to achieve FSD. To draw 50 µA from a 1.5 volt cell requires a circuit with a resistance of 30 kΩ, Fig 1, so we need to arrange a series circuit with say a potentiometer of 50 kΩ set at maximum resistance in series with the meter under test driven by a 1.5 volt cell. Insert into the circuit a test meter (multi-meter) and adjust the potentiometer until the meter under test reads FSD, Fig 2. The current value shown on the multi-meter meter will then be the current for the meter under test at FSD. We can now make better use of the table to determine the coil's resistance. If control of the potentiometer is too course, it is likely that the meter under test is a higher range say 1mA FSD. A quick calculation will reveal that 1500 Ω is needed in conjunction with a 1.5 volt cell for 1mA to flow. Use a 2kΩ potentiometer in this case. Now re-arrange the circuit, Fig 3, so that the potentiometer becomes R1 in the diagram and choose a similar potentiometer for R2.. With S1 open, adjust R1 to give FSD. Close S1 and adjust R2 to give half scale deflection. Open S1 and measure the resistance of R2 with a multi-meter which is the resistance of the coil of the meter under test. As to whether you should buy that meter well it's still a gamble. If you want to measure µAmps a meter designed to read 1mA without a shunt won't do the job! Caveat Emptor! Lastly, treat the above as a procedure; do the calculations for yourself and make sure that resistances are always higher than needed to start with. My thanks to G1KWF for verifying the technical aspects. BR68 went defunct with formation of Ofcom. With the recent letters emanating from Ofcom concerning proposed changes to the licence conditions, reference has been made within the amateur radio community to the BR68 document. The author has confirmed with Ofcom that this publication is in fact defunct. Unfortunately, details of the document still appear on the Internet although apparently it has not been updated since 2003. It was published by the Radio Communications Agency which was the predecessor to Ofcom. Since Ofcom introduced the 'License For Life', the relevant information has been included within Section 2 of the Licence along with operating limitations at Schedules 1 and 2. Once the Ofcom proposals are finalized, it is expected that appropriate amendments will be made to the on-line licence which can be printed at any time (there is no need to wait to revalidate your licence). BR68 should be disposed of as it longer has any legal status.